Whereas my previous iPod, a 3rd generation model, could not display album art, my new one, of course can. So I spent a portion of my morning going through my library, searching for albums that were missing their covers. During the process, I ran into a couple live shows that, since they aren’t formally-released albums, obviously don’t have album covers. Specifically, I had a Tortoise show in San Francisco from October 2005 and a Mouse on Mars show in Toronto from October 2004. Most music clubs I’ve been to in recent years seem to have a laid-back “we-don’t-care” policy toward shooting photos of the acts that roll through, so it is not uncommon to see folks with digital cameras snapping away. Heck, I even saw someone with a video camera (or possibly 8mm) at a recent Ratatat show. Even if a venue does prohibit recordings and photography, the rise of cell phone cameras and pocket point-and-shoots almost ensures that some clandestine pictures will escape. Knowing this, I went over to Flickr, where a good portion of the world’s digital pictures eventually end up. I hoped to find, if not pics from the specific shows, something close enough for displaying on my iPod. The mission was a success. 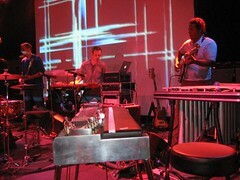 A couple searches later, I found a really nice shot from the exact Tortoise show at The Independent shown above. I did not, however, track down anything from Mouse on Mars’ performance at Lee’s Palace. But I did get a nice one from the show in Montreal the day before and that’s close enough for rock and roll. Those two shows now have some nice iTunes artwork.